Purchasing the latest edition of our Business Copier & Multifunction Buyer's Guide is a only small investment, but one which will pay for itself many, many times over! 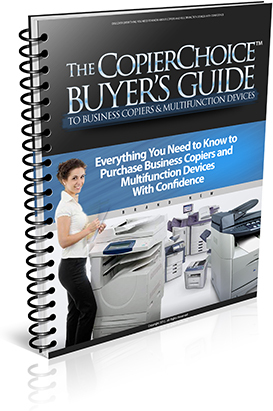 This comprehensive 40-page guide now has updated information and contains everything you need to know in order to make a confident purchasing decision on a business copier or multifunction device, which can potentially save you thousands of dollars. Purchase now or claim your free copy when you use CopierChoice to get your copier quotes. DO NOT SIGN ANYTHING UNTIL YOU READ THIS! Should You Finance Copiers or Buy Outright? Buying New or Used Copiers - Which is Best? Australia's Leading Resource for Business Photocopier Buyers.